Wow wow wow it's a good time to be an Arsenal fan at the moment. Let me elaborate why. Like years ago, I noticed this club mainly because of Cesc Fabregas. He is a Spanish football player whom I found very good looking back then and it can be said that I first like Arsenal because of him. Looking further into the club, there are Alexandre Hleb, Tomas Rosicky and of course, Arsene Wenger whose presence makes me like the club more. I downloaded Arsenal wallpapers and followed the players on twitter, so I kind of support this club. However it was not all happy days. In a certain period, Arsenal sold many of their key players, including Cesc and also Samir Nasri and Van Persie. I know that Arsenal needed money at that time, many other clubs in the league are funded by Arab money and they were buying star players while Arsenal was working hard to build a new stadium, so the transfer happened. Needless to say, Arsenal didn't perform well the next season. And then a few years ago, Arsenal bought players like Per Mertesacker, Laurent Koscielny, Santi Cazorla, Mikel Arteta, Thomas Vermaelen, Nacho Monreal and Olivier Giroud. They were no big names. However, their joining the club is the beginning of a new era. All of them are proven to be decent players and the 2012/2013 season was quite satisfying. Still no trophies, but at least the team has depth, stability, ambition and a grand huge state of the art stadium. Aaaannndd..... WE SIGNED MESUT OZIL!!! It is like a dream come true. For those who have no idea, Ozil was Real Madrid's number 10 player and Germany best player of the year. Imagine. 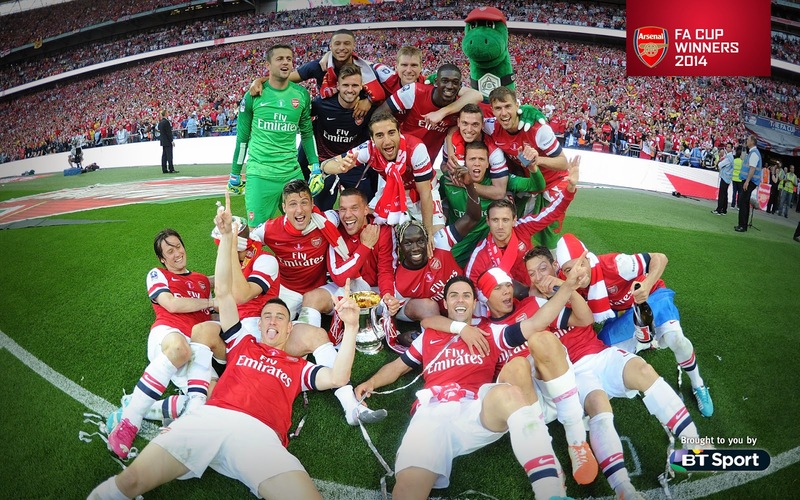 Our last season was very very enjoyable + we win the FA Cup, our first trophy in 9 years. Aaaaaanndd..... YESTERDAY WE SIGNED ALEXIS SANCHEZ!!! One of the world cup's best performing player and Barcelona's number 9. Seriously I can't wait for the new season to start yeaasss Arsenal yeaaassss!! On a more serious note, I would like to express my gratitude to our manager Arsene Wenger. The boss has worked so hard, has been so loyal to the club and prepared this club for a long term future. Thanks to him, we now have one of the most beautiful stadium on earth, a strong and solid squad and is aiming high. Our director Ivan Gazidis said in 2012, "In the next two years, we will have the financial resources to sit and compete among the leading clubs in the world" and thankfully today, Arsenal has passed the rough time and is even a bigger club. We are no longer a selling club, we are not anymore provider for the richer clubs, we are competing in the champions league and we are a serious title contender in the upcoming season. Van Persie can't say no more that Arsenal is lacking ambition. Well I am kind of emotional writing this, I love Arsenal. All of the club. The players take care of each other and Arsene is there looking after all them, it's just beautiful. LET'S ROCK THE NEW SEASON TOGETHER ARSENAL!! !